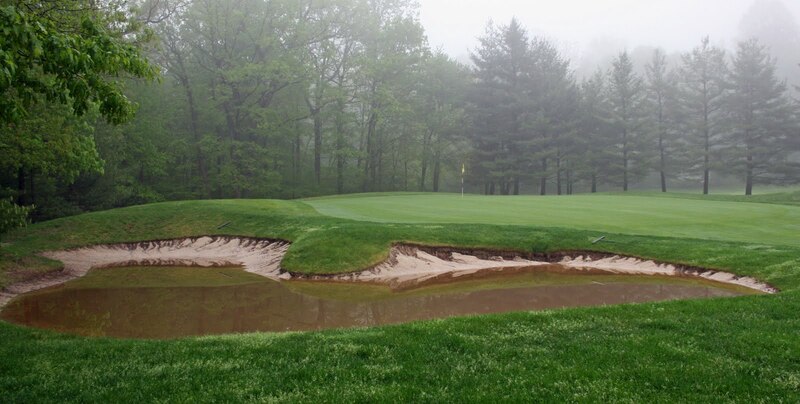 Recent heavy rains have put a strain on golf course maintenance crews around the state. Many courses have received over seven inches of rain in the last two weeks. This coupled with the warmer temperatures has turfgrass growing faster than it can be mowed. 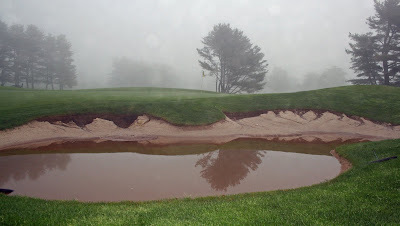 Every spring, golfers have to cope with thick rough, but conditions have been unusually tough the last couple weeks. Many areas on courses were un-mowable due to severe saturation. In addition to the inability to mow some areas for extended periods of time, the application of growth regulators has been delayed because many need to dry on the plant for them to work. Smaller labor forces, spring plant protectant applications, spring weed control applications, aerifying, landscaping and the weather have stretched every courses resources to its limits. The good news is… it looks as if the weather is taking a turn for the better! 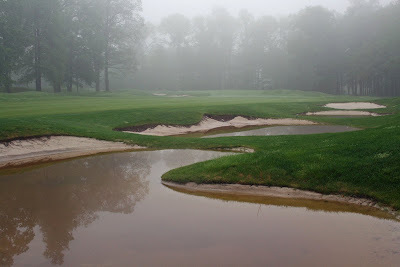 Expect to see major improvements this week because course maintenance staffs will have better conditions to work with. Ground conditions will improve, allowing workers to mow, blow the heavy clipping piles and mow again. My guess is that most players can relate to that if they have a home lawn to take care of. Playing “catch-up” will strain the labor force because it takes more man-hours to accomplish the desired results. 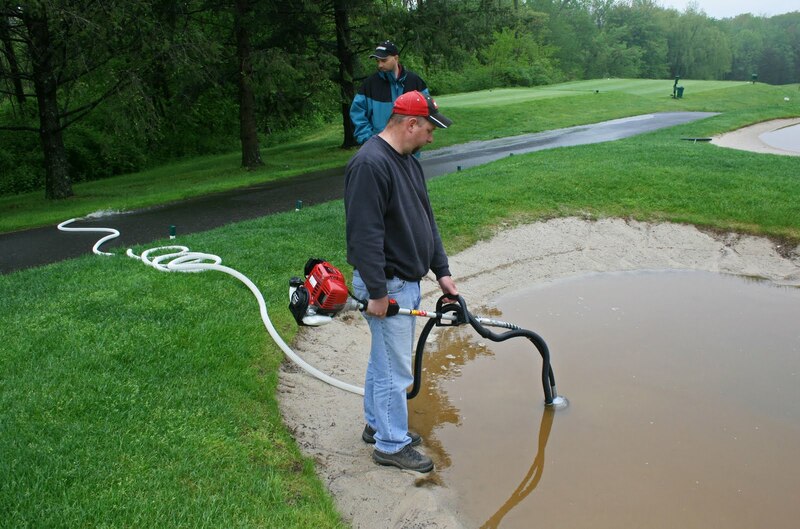 Golfers must also understand that the necessary unseen maintenance practices reduce a courses available man hours needed to accomplish the tasks which are visible to the players. A good example is the application of plant protectants, growth regulators and weed control. These treatments must be done early in the year or players will certainly notice the difference later in the season. Be patient and enjoy the fine weather and improving conditions which are headed your way! A few days of dry weather has been a welcomed respite from the deluge of rain throughout the Northeast in April and May. With luck, drier weather will continue as we head towards Memorial Day, a prime golfing weekend throughout the country. Due to the frequent rain, golf courses have battled a multitude of weather-related and agronomic problems over the past few weeks. Penal, thick rough has been a constant source of discussion on golf course visits recently. 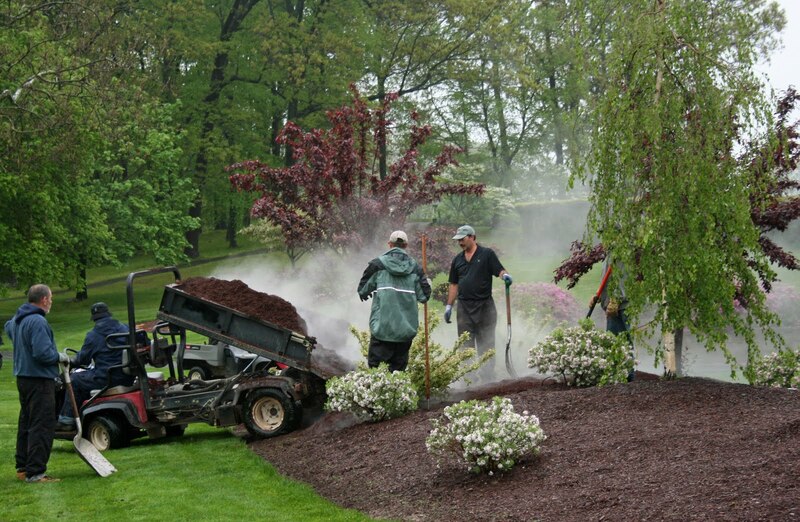 The growth rate of the rough turf, combined with saturated soils that are prone to tire rutting, has been next to impossible to keep up without damaging the soil structure or producing excessive clipping piles. The abundance of heavy rain also has been frustrating to many golfers who want to play, even though the course is nearly underwater. 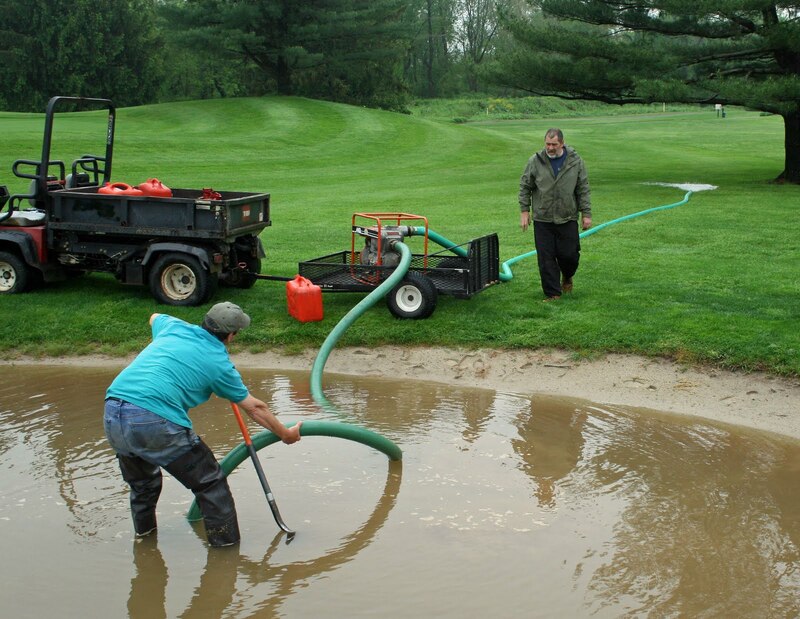 Playing on puddled and saturated greens is never good for the turf, and particularly damaging to soil structure. Golf cart restrictions have been necessary at most facilities. 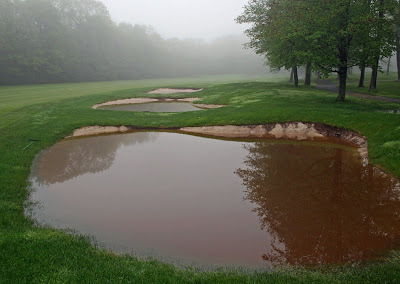 It is difficult to predict the damage potential from a few golfers playing on saturated greens, but everyone should agree that nothing good comes from golfer traffic in these conditions. Thankfully, these frustrations diminish as the soils dry. 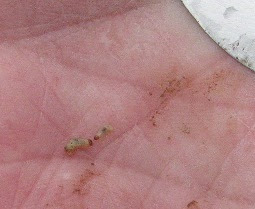 Annual bluegrass weevil larvae were observed in the past two weeks in New Jersey. Frequent scouting for this insect is necessary to prevent significant damage. Annual bluegrass weevil larvae (and slight damage) were observed at several New Jersey golf courses in the past two weeks. These larvae are likely to be active throughout most of the Northeast. Keep a close eye on areas with a history of annual bluegrass weevil damage. Discolored annual bluegrass (Poa annua) could be mis-diagnosed as drought stress when soils begin to dry. Scouting early and often is necessary to maximize control programs and prevent significant injury. 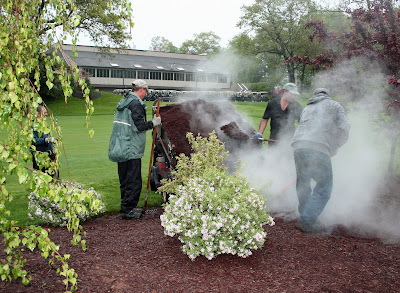 Visual inspection of the soils in areas of past damage, soap drenches (lemon scented soap is ideal), and submerging turf plugs in a salt solution are excellent ways to identify insect numbers and life stages as you consider initial control and future action. 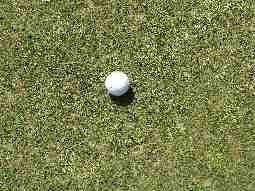 Golf courses that experienced putting green winter damage are still in recovery mode. Whether seeding or sodding was used, inconsistent temperatures and saturated soils have slowed recovery to some extent, especially when the greens were opened for play before the young turf was adequately rooted and healthy. Healing from winter injury is never easy, but golfer patience and conservative management practices will allow the injured areas to recover and survive through the stressful summer weather. Many winter-damaged greens may look bad, but they play fine after a few topdressing applications. It is important for golfers to focus on playability rather than aesthetics as much as possible, especially if winter damage has occurred. • Maintenance procedures like: aerifying, topdressing, verti-cutting, venting, hydrojecting, etc. 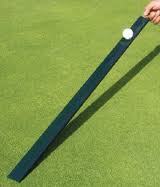 Name at least ten things that effect green speed and consistency. OK, that's twenty! The list of factors that affect playability of greens goes on and on. Some factors like soil type, turf species, drainage and green size, etc., are fairly constant at most courses. Almost every other component to the equation is a fluctuating variable. The superintendent has a wide range of control of these factors varying from total control to no control. This is not simple math. One and one never equals two. We are talking about the un-natural manipulation of a living organism, under a wide range of uncontrollable environmental conditions in a micro-climate we have unnaturally forced upon it. We do everything we can to keep speed and consistency our priority regardless of the uncontrollable factors. Let's look at the past week at my course, The Farms Country Club. These are just my circumstances this week. Every course is different. Courses that just aerified might be facing additional issues like trying to keep mower blades sharp enough to get a quality cut. Maybe your course is trying to re-establish turf from winter damage. Maybe your course gets 100,000 rounds a year, the greens are the size of postage stamps and are located in spots that get limited sun or air flow. I could go on and on. The point is that your superintendent is doing everything he / she can to consistently manipulate your greens, in an unnatural way, with many uncontrollable, inconsistent and unpredictable variables. Regardless of budget size, equipment inventory or their labor staff's experience, every superintendent has to have the ability to consistently adapt and overcome the consistently changing environmental circumstances in which he / she is presented. To my chagrin, Mother Nature still holds most of the cards. 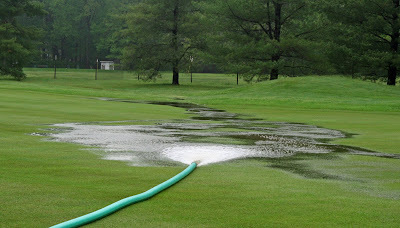 The maintenance staff is hoping the heavy rains have ended. We are pumping water from the bunkers today and hoping they can be fixed tomorrow in preparation for the weekend tournament. Rain totals have already surpassed the five inch mark. The course is completely saturated and unplayable right now. Weather reports indicate continued showers and thunderstorms today and tomorrow. The maintenance staff has been unable to do any mowing for the last two days. Hopefully the rain will subside and we can try to get at least the basic maintenance accomplished for this weekend's Founders Cup tournament. Expect some tough rough this weekend! 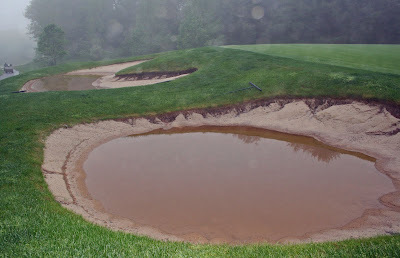 The pictures below give you an indication of what course conditions are like. 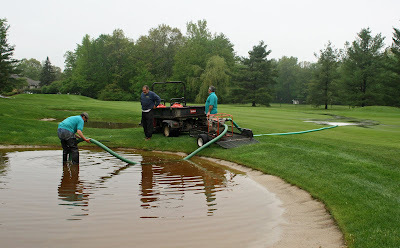 Despite the continuous heavy rains this week, the maintenance staff has plenty to do. 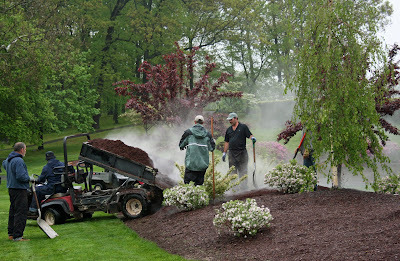 Mulch is being spread in the landscape beds and flower beds are being prepared for the arrival of our annual flowers next week. Below is the re-print of today's USGA regional report. It is very informative. We at The Farms CC have high populations of Annual Bluegrass. It is easy to spot the Creeping Bentgrass on our tees, greens and fairways. They are the patches of turf with the "off-color" purple or brownish tint. Each spring we treat all tees greens and fairways with specialized growth regulators which inhibit Annual Bluegrass's seedhead production. While this may cause turfgrass to yellow, the applications have some important benefits. Instead of the plant using much of it's energy for reproduction, it goes toward root growth. There are less undesirable seeds in the soil that can germinate in the future. Playability improves because mowers have less dificulty getting a high quality cut (seedheads grow fast and are wirey in texture). Seedheads on greens make for a very bumpy putting surface. If you want to see a lot of seeding Annual Bluegrass... Just check out some of the rough for comparison. Especially in the shaded and/or compacted areas. Off color bentgrass at this time of year is usually due to cool temperatures and mechanical injury. Adjacent annual bluegrass may be unaffected. Newly established AB usually seeds prolifically and will likely be more susceptible to stress and disease later in the season. • Bentgrass throughout the middle and southern part of the Northeast Region now is showing the effects of cool nights and mechanical injury. Plenty of bentgrass is off color, has a bronze cast, and may be experiencing some thinning. AB right next to the bentgrass looks perfectly healthy. Many misdiagnose this as leaf spot, and while a disease may be involved, it usually is nothing more than the weather. 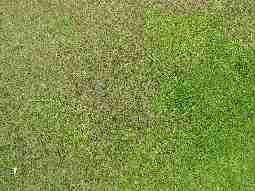 When warmer temperatures arrive, the growth rate of the bentgrass will take off, and the discoloration will dissipate. • There are plenty of AB seedheads throughout the region this year, especially at courses that did not treat preventively for seedhead formation due to injury suffered last summer or this last winter. Seedhead production is particularly heavy in areas that sustained damage. Keep in mind that the prolific seedhead production in the damaged areas is a sign that newer, weaker AB has become established. These weaker biotypes will be more susceptible to stress and disease later this summer. If your course has a lot of AB seeding in the damaged areas, more conservative management may be in order this year. In time, the weaker annual bluegrass biotypes will be replaced with better ones, and later with more bentgrass. However, for the first year or two after damage, they will be a bit more susceptible to turf loss. Spring aerification of the greens was completed three weeks ago. Cool temperatures slowed the healing process but we're in great shape now. A light topdressing this week smoothed out most of the remaining bumps and speed has increased. We are right on target with our spring height of cut reduction goals. Our goal each spring is to be at .120 inches by the third week in May. Each Fall, we slowly raise the height to increase the size of the leaf blade. A larger leaf blade helps the plant increase food production through photosynthesis. The increased food production improves root growth, our primary focus in the off season. 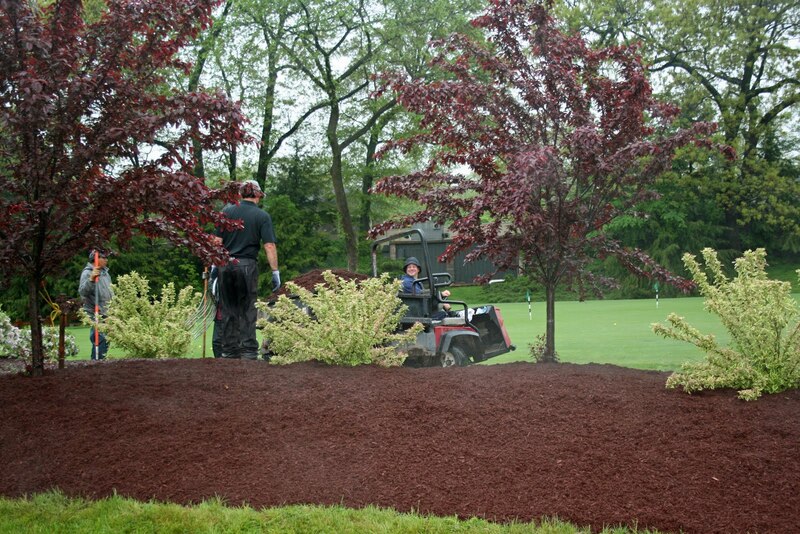 Stregnthening roots during this period of time increases our chances of turf surviving periods of stress, especially the summer months. When spring arrives we slowly reduce the height of cut to coincide with the golf calendar. Our goal is to give the plants every opportunity to reach its full health potential, while maintaining member satisfaction. Obviously, spring aerification reduces putting quality for a short period of time, but its season-long benefits afford us the ability to consistently maintain the greens to the level our members have become accustomed to.